The Congregation of the Daughters of St. Camillus was founded on 2nd February 1892 in Rome, by Blessed Fr. Luigi Tezza, MI and Blessed Mother Josephine Vannini. It is an International Congregation having its Generalate in Grottaferrata, Rome – Italy. The Institute has been encouraged with reverse enlightenment by our Saintly Father Camillus de Lellis, the true patron of the sick. 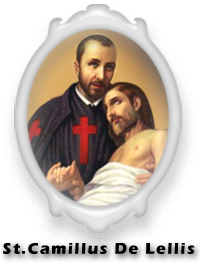 St. Camillus was born in Bucchianico (Italy) in 1550. By a miracle of God’s grace, from being a rebellious, wayward youth and inveterate gambler, He was converted at the age of 25 and consecrated his life to the care of the sick and the reform of health care. He founded the religious order of the Ministers of the Sick (Camillians), in the year 1582 and instilled into his followers the practice of Religious perfection and heroic charity. The sick, so utterly neglected in those days, became his Supreme Master to be served and venerated as the suffering members of Christ’s body. He died on 14 July 1614 in Rome and he is the Patron of sick and those who nurse the sick. It was the unfinished dream of St. Camillus to begin a female Congregation, because, in those days the Nuns were not allowed to go out for their Apostolic activities. And so, the members of the Camillian Order, who were brought up in the same spirit of St. Camillus, desired not to hold the Camillian Charism only for the male section but to expand it to the female section too. The heroic charity of St. Camillus could not have gone unnoticed by many pious women who of their nature are more disposed to feel pity, to a life of dedication and sacrifice, and could not have failed to arouse in them a deep appreciation of this Saint’s outstanding virtue and a desire to imitate it. From the very first beginnings of the Order of the Sick, its history shows there were many good souls who cooperated with these religious, especially the so-called Camillian Tertiaries who continued their help until suppressed during the troublesome times of last century. This desire was fully revealed through Fr. Luigi Tezza, after his election as the first Consulter General, which entitled him to the office of Procurator General of the Order, at the XXXVI General Chapter of the Order held in Rome on September 1889. Fr. Luigi Tezza was born in Conegliano, Italy, on November 1, 1841. His family was morally healthy and practiced their religion. His Mother Catherine was a woman of rare quality who encouraged Luigi in spiritual life. Little Luigi learnt the skill of healing and giving comfort to the sick through his father Augustus, who was a good doctor. He lost his Father when he was nine years old. After having completed his secondary school studies in Padua, on 8th December 1856, he entered the novitiate of the Camillian Fathers in Verona. 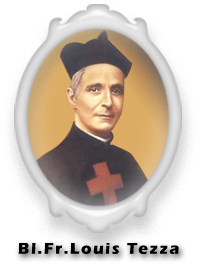 At the age of 17, on December 8th 1858, he made his religious profession in the Camillian community of Verona and ordained priest on May 21, 1864. He was entrusted with many offices like master of the Novices, Provincial Superior, Vicar General and many times Superior. After his appointments as Consulter General and Procurator General of the Order, with the permission of the Superior General, Fr. Mattis, Fr. Tezza returns to France to complete certain undertakings. In the years spent in France he had the desire to give life to a group of women to help the sick according to the spirit of St. Camillus. He had already obtained the permission of the general Council and was following a group of women oriented to religious life. Needing, however, to live in Rome because of his new Job, he was not able to attend to them. He prayed and waited for the moment in which God would help him to find the right persons to realize his plan in Rome. Meanwhile he continued to look for a suitable young woman both enthusiastic herself for the charism of charity and disposed to give to the sick “a heart of a mother,” as he desired or better, as St. Camillus was requiring of his Sons. The Divine Providence came forward to raise up a courageous and generous young woman who was ready to pursue the ideals of heroic charity of St. Camillus, submit herself to his Rule, wear a similar habit and eventually become an instrument to found a Congregation of women religious. Her name was Judith Vannini. Judith was simple, righteous and a large-hearted soul and the light of faith soon enabled her to give direction to her life. She wanted God to be her all and the religious life her chosen path. But many obstacles were to stand in the way of her good intentions. She was desirous of joining the Sisters of St. Vincent, but God had different plans for her, just as he had for St. Camillus when he wanted to join the Capuchins. All her hopes seem dashed until God extended his merciful hand to help this faithful creature, who had never ceased putting her trust in him. To do this, he made use of a worthy son of St. Camillus, Fr. Luigi Tezza, Procurator General of the Order, a godly soul imbued with simplicity and determination. This good priest happened to meet young Judith when she was making a Retreat organized by the sisters of Our Lady of Cenacle for young women from French colony residing in Rome. When he came to know of her pious intentions, he was inspired to reveal to her his plans so far unsuccessful, to found a Congregation of Camillian Sisters. Judith Vannini asked for time to think over his proposal. She prayed and sought advice and very soon, in all simplicity and with candid open-heartedness, returned to Fr. Luigi and generously submitting herself to his guidance, she offered to take on this arduous task. With the authorization of Cardinal Vicario, after a period of preparation under the direction of Fr. Tezza , on February 2nd 1892, in the Chapel of the General Curia of the Camillians in Rome, in the room where St. Camillus died, Fr. John Mattis, Superior General, conferred on Judith and her two companions the scapular with the red cross of St. Camillus and the document for affiliation to the Order. The plan of Fr. 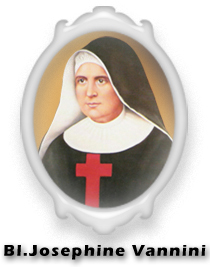 Tezza is to found a female Congregation with the same charism of his order which “expresses itself and is realized in the spiritual and corporal works of mercy towards the sick”, practiced with a vow “even with the risk of one’s own life.” On March 19th of the same year, Judith was clothed with the religious habit, receiving the name Sr. Mary Josephine. God caused this tender young plant to thrive and blessed it in its pursuit of good works, but not without subjecting it to many trials, which even threatened to rend it apart. It found the strength to overcome such obstacles, which only served to reinvigorate and strengthen this young plant now well established in the sacred territory of God’s Church on earth. Under the enlightened guidance of the holy priest who was inspired to bring this work into action, Mother Josephine made rapid strides along the way of progress, becoming Mother, Teacher and guide to all the young girls the Divine Providence sent to her. With God’s help, the little community flourished and Mother Vannini was able to extend her field of action, during her lifetime, by opening new houses in Cremona (August 1893), Mesagne (November 1894), Grottaferrata (July 1896), Caprarola (July 1899), Rieti (January 1901), Monticelli (January 1901) Bonsecours – Belgium (October 1901), Brescia (March 1904), San Bassano –Cremona (October 1904). A centre was established even as far as Lille in France until it was disbanded because of the persecution it suffered. Mother Vannini sought even broader horizons and in the year 1906, she was soon able to send a small group of her religious to Argentina in South America. In the year 1895, Fr. Tezza was re-elected as the General Councilor and in 1898 he returned to his province in France, though far away he still tried his best to look after the society he had started. In 1900, Fr. Tezza and Fr. Angelo Ferrini were send to the house in Lima (Peru) as the Delegates of the Order of the Ministers of the sick, in order to reunite that community to the Order. He had to bid good bye to his native land and to the Congregation he had started and to remain there until his death. He was able to keep in touch with the Daughters of St. Camillus only through letters and correspondence. He encouraged them by giving them the necessary instructions. All the sufferings and sacrifices he endured, he offered it for the growth of the society of the Daughters of St. Camillus. With the departure of Fr. Tezza for Perù, Mother Vannini remained alone to guide the young Institute. But, God did not allow our Mother Foundress to remain long time here on earth. Fatigue had sapped her strength and the illness caused her to stop all the good works she had in mind. It was on the morning of 23rd February 1911 that her blessed soul took flight to her eternal abode. She was beatified on 16th October 1994. After the death of Mother Josephine Vannini, under the leadership Mother Alfonsina Ferrari, the second Mother General, the small Institute continues to spread the mission of charity in different parts of the world. Although Fr. Luigi Tezza, who was getting on years, he never stops his guidance through correspondence. The distance, which separates them, was great but, the love which units them in the Lord was much greater. The Institute had to undergo another trial period when the Father Founder left this world on 26th September 1923, in the house of “Santa Maria De La Buena Muerte” in Lima, surrounded by his community in prayer. He was beatified on 4th November 2001. The Spirit of the Lord continued to animate the Institute with many vocations rendering it possible to open more houses and to spread the fragrance of the charity of Camillus in many parts of the world. Until 1939, 17 communities were established in different parts of Italy, Holland and South America. From 1939 onwards, the Congregation expanded to Germany, Brazil, Peru, Spain, Colombia, Burkina Faso – Africa, India, Benin – Africa, Poland, Portugal, Philippines, Georgia, Hungary, Chile, Sri Lanka, Mexico. The specialty of the Camillian charism is to serve the sick even at the risk of our life. It constitutes the essential aspect of our mission. The healing activity of Jesus for the sick occupies a very large and essential part in the Gospel and it becomes a great sign of salvific mission of Jesus, our Messiah. Our mission is inseparably united with the Redemptive mission of Christ. Practicing the works of mercy towards sick and the needy, the Daughters of St. Camillus are continuing the Ministry of Jesus as healer. The Camillian Spirituality is a radical style of life and it requires to identify ourselves with the merciful Christ and become good Samaritans to our neighbor in his or her greatest moment of vulnerability. (Lk 10,30–37) Christ is a doctor and Savior of humanity, portrayed himself as the “Good Samaritan.” From this parable derives one of the two main aspects of our spirituality and it presents us with the mission itself: that we ourselves be Jesus (the Good Samaritan) who looks after the wounded, the sick etc. We are called by Christ to continue His Mission to be actually in the world the human presence of the Merciful Christ. The charism of St. Camillus gave way to flourish in the Indian soil by the encounter of our late Mother General, Mother Giuseppina Calvi with Fr. Werner Chackalackal, CMI, who became the instrument to fulfill the design of God and the desires of our Mother. In fact, it is only through him and some of his confreres, we, the Indian sisters could know about the Daughters of St. Camillus, in the year 1965. From that year onwards he worked tirelessly, with the help of other CMI fathers working in India, to find out the first Indian candidates and send them to Germany and Italy for their formation and studies. After some years of preparations, on 15th October 1972, Most Rev. Mother Giuseppina Calvi, then the Mother General of the Institute and Rev. Sr. Saveria Gafron, the Provincial Superior of the German Province, together with the first two Indian sisters, Sr. Ruth Kizhakkumthala and Sr. Genovieve Moolan, came to the southern part of India, precisely in a hilly village of Kuttiyamvayal, situated in Wayanad Dt., Kerala, the place where Fr. Werner had already made arrangements to start the first house in India. Due to the lack of medical assistance and transport facilities, the sisters felt the necessity to start soon a Dispensary there, in order to reach out to the poor and neglected of that area. With the support and encouragement from the Generalate in Italy as well as from Germany, the sisters were able to continue their mission in India, even in the midst of difficulties. Some of the Italian sisters tried to work as Indian missionaries, but they were not allowed to stay in India for longer period. Finally, after some years, the Lord was good enough to keep in India the presence of Sr. Celsa Bonato from Italy, as a mother and guide and every step in the growth of the Indian Delegation was taken under her care and guidance. She came to India in the year 1977 and on 2nd February of the same year marked the opening of the long awaited novitiate house in India and appointed her as the novice mistress. This house remained as the house of formation for another ten years and in 1982 it was transformed as the centre for mentally challenged female children. As the peaceful and serene atmosphere for the novices in their formation was very badly affected due to the famous revolt of the farmers in Kerala in the year 1982, the Congregation had to shift the novitiate house to Bangalore from Thariode in the month of May of the same year. As they reached in Bangalore, the sisters were not able to find out soon a proper house and they were given hospitality for 7 months in the formation house of the Little sisters of the poor, situated in Hennur main Road. Meanwhile, with the help of Pallotine Fathers, the sisters were managed to acquire a piece of land with a modest house, at 5th mile Hennur Main Road, Bangalore – ’43. In this way thanks to God, on 23rd December 1982, two days before Christmas, the sisters and the novices were able to settle in the new house. The community was then composed of 2 sisters and 8 novices. The construction work for a new formation house was started soon. The new novitiate house was inaugurated on 2nd February 1986 and the rest of the work was completed and inaugurated on 28th January 1989. This house was functioning as the Delegate house of our Indian branch until it became a Province on 03rd September 2008. At present The Province has 215 professed members engaged in the various fields of health care apostolate, such as: Hospitals, Dispensaries, School & College of Nursing, Homes for the aged, Institutions for handicapped children, Leprosy colonies, and Homes for people affected with HIV/AIDS. The mighty work of God and the sacrificial life of our first sisters have made it possible to expand the special charism and spirituality of St. Camillus in the states of Karnataka, Kerala, Tamil Nadu, Andhra Pradesh and Orissa, performing the healing ministry of Christ in fourteen communities. A large number of sisters, who are formed in the Indian Province of the Daughters of St. Camillus, are joyfully rendering their missionary services in Italy, Germany, Spain, Portugal, Africa, Sri Lanka, Philippines and Georgia. This co-operation and help among the members of the Institute, create unity, better understanding, more knowledge and an occasion to transmit the real spirit and visions of our Founders in the various field of actions the Congregation has undertaken at this present time.